From Thanksgiving until last weekend, I was out-of-state working. It's good work, and I'll be doing it for a while, which means back & forth. I have enjoyed the city amenities...but hadn't realized how much I missed my home base in Driggs, Idaho until I returned last weekend. Holy cow, this place is beautiful! 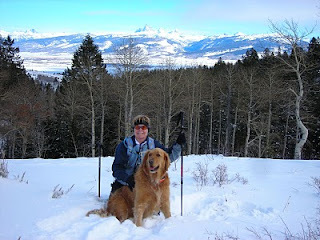 Teton Valley offers the dual advantages of incomparable backcountry, and virtually no crowds. 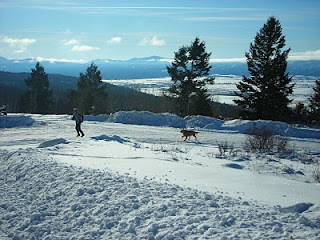 I nailed a perfect weather weekend, and Joanne & I took advantage with some great outings. It was wonderful to get re-aquainted with the landscape that has become such a part of me over the past 15 years. 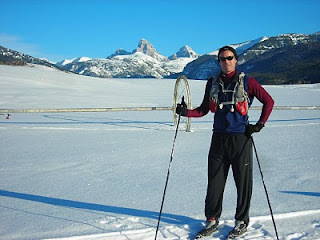 We kicked things off with a favorite snowshoe hike in the Big Holes, showcasing views across the Valley...the iconic Tetons as background. Snowpack is definitely low, possibly the lowest I've seen at this time of year, which probably just means more snow in April. Joanne and Bridger paused for this classic photo. 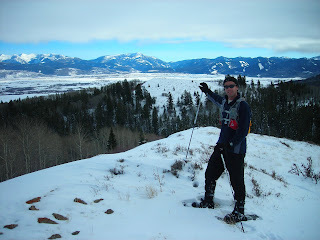 I've always loved pointing out the views, and naming mountains in the distance. It was great to be back in the old stomping grounds, taking it in. Joanne showed her form on this run up Shooting Star, a longtime favorite, and Bridger's flapping ears kept up It gets better the higher you go. 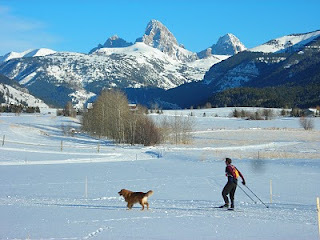 The Grand Finale was X-C skiing around the groomed Alta, WY trails, with Teton Canyon standing watch. I had to keep stopping to absorb the views, and pinch myself. If there is a more gorgeous place, I haven't seen it. We are lucky to have such beautiful winters. We always get a little sunshine after a storm and we enjoy 30 degree weather often. Glad you are taking advantage!